TTT Extras 5: Screencaps from the extras compared to final film versions. As was the case for the FotR bonus materials, the extras for TTT contain bits of footage from the films that looks different from the way it appears in the final cuts. Sometimes it is because the sequence shown in a “making of” segment or in a trailer has not yet been digitally graded (changing the colour), or has been graded differently. Sometimes the extras show material that was shot but which was never included in the films, theatrical or EE versions. As usual, all the caps have been cropped and tweaked slightly for better focus and lighting. 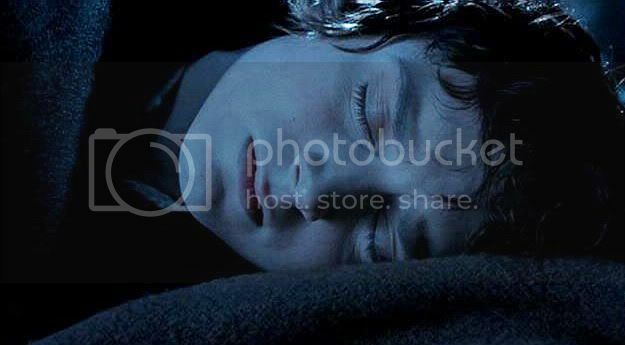 Also from Return to Middle-earth, the caps below come from a sequence showing Frodo in the Emyn Muil at night, just opening his eyes to listen as Gollum makes his entrance crawling down the cliff face. Here's the same cap (or nearly), but from the EE of FotR. Obviously, the same footage was used to show Frodo listening to Boromir and Aragorn as they are argue on the banks of the Anduin. The image has been reversed, but also the grading is quite different. 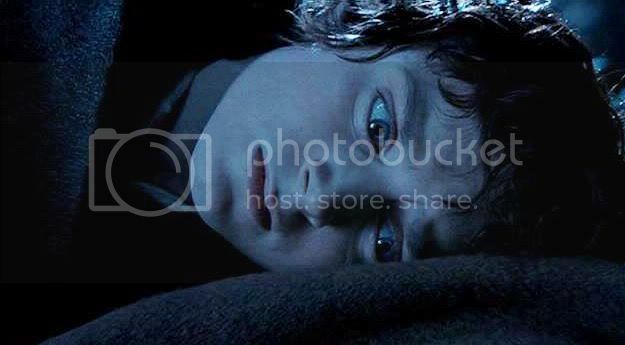 I've always wondered where this beautiful shot came from (I always called it, "St. Frodo the Martyr"). I have seen versions of it in Internet galleries for years. But it is not in the film, theatrical or EE. As it turns out, it comes from The Two Towers theatrical trailer (not the "teaser") included in the extras. Below is another sequence of caps that shows a very noticeable difference in digital grading between the trailer and final version of a scene. They show Frodo and Sam hiding from the Nazgul in the Dead Marshes. The sequence below, from Behind the Scenes Preview of “The Return of the King”, not only has different grading from the theatrical version, it shows footage of Frodo that does not appear in the final version of RotK (theatrical or EE). The setting is still Ithilien, the scene in which Sam wakes to hear Gollum/Smeagol plotting their deaths. Frodo pulls Sam off Gollum, the argument winding down as Frodo says, “We can't do this by ourselves, Sam, not without a guide. I need you on my side.” “I’m on your side," Sam answers. “I know, Sam, I know," Frodo assures him; "Trust me.” The caps below appear to show Frodo’s coverage in the scene as he says, or is about to say, "Come, Smeagol." In the final film, it is Sam's reaction to Frodo's line that is shown. Again, I’d love to be able to have *all* the footage that was shot for this film one day. 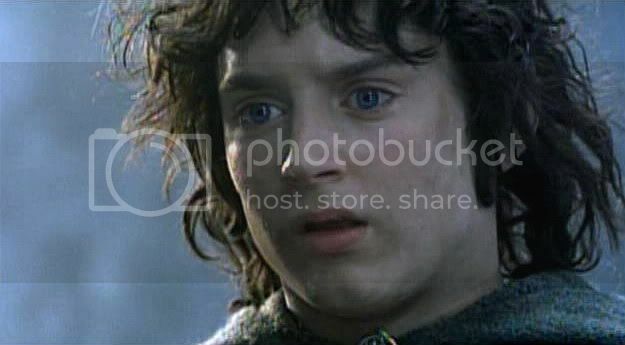 Also from the RotK preview, this series of caps of Frodo from Shelob's lair leapt out at me because of their beauty and clarity. I went through the film scene again, but never could find these exact frames. 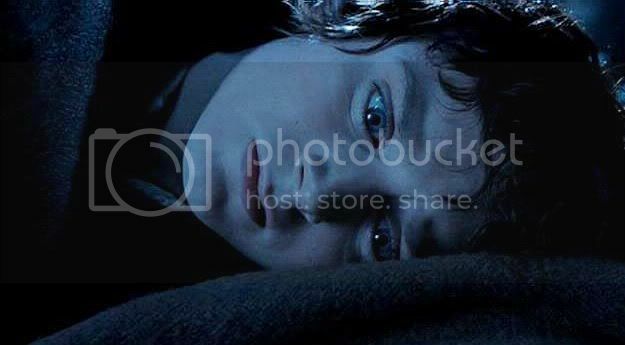 Judging from the background, the moment comes not long after Smeagol has abandoned Frodo inside the tunnel. After he has put his hand in the spider web ("What is it?" "You will see"), Frodo begins to feel panicky, calling, "Smeagol, Smeagol!" I dearly wish that some day New Line will produce a compilation of unused footage from the film, especially the stuff that was never digitally graded. I appreciate the mood the grading can produce, but I also love being able to see the real colours of the hair, eye and skin tones of the actors, as well as the gorgeous sets, props and costumes. ~ TTT Extras Pt. 1: 'The Long and the Short of It'. ~ TTT Extras Pt. 2: Assorted caps with Elijah Wood. ~ TTT Extras Pt. 3: Elijah Wood interviewed, looking like angel. ~ TTT Extras Pt. 4: Miscellaneous stills and publicity shots. ~ TTT Extras Pt. 5: Screencaps from the extras compared to final film versions. ~ Main page of all links. Ah, Mews, can't you just *imagine* the beauty and clarity of the Frodo material, just based on the difference between the Trailer frames and "final cut" frames of Aragorn and Arwen's material? I would love to see more of the untouched footage too! Isn't it interesting, the difference a change in colour makes? No wonder they use digital grading; it really affects the mood without the viewer even being aware of it. The art design people (or PJ or both) on these films must have had a wonderful and trying time making their minds up which way to go, colourwise, for each scene. I wish they'd release an un-graded album of shots, though. I really adore being able to see the actual colours for all the super costumes and props, as well as the actors. 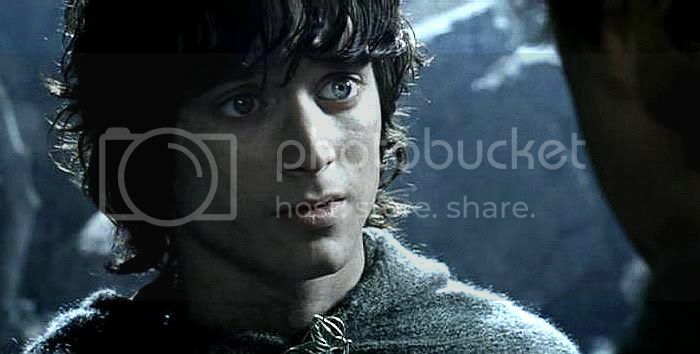 Mechtild ~ I love Frodo's expression on the unused ROTK 'I need you by my side' shot. 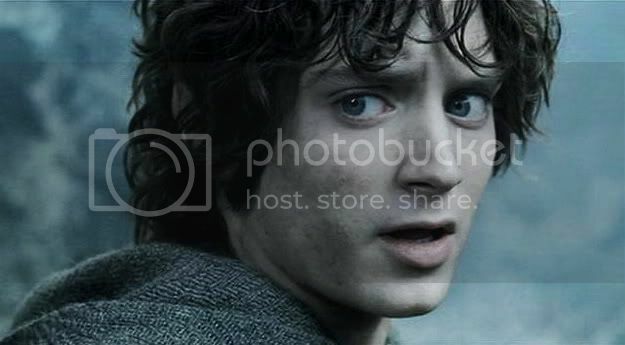 You are so observant to notice the flipped shot of Frodo waiting for Gollum to pounce ~ I've recently made screencaps of the scene where Frodo is listening to Boromir and Aragorn on the riverbank, and would never have made the connection. After seeing the trailer for TTT, I was disappointed not to see 'St Frodo the Martyr' in the final film. IMO those few seconds of film produce an incredibly powerful image ~ as do your beautiful caps of the shot. The colours in those caps of Arwen and Aragorn are really exquisite, as are those shots of Frodo and Sam hiding in the Dead Marshes. Digital grading creates an atmosphere, a certain 'feel' the film-makers are striving to achieve in any particular location or situation, but from a purely aesthetic angle, these originals are stunning. Oh, for Frodo originals. 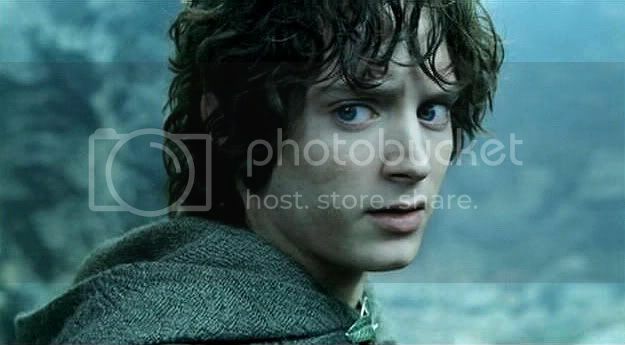 I would sign any petition to see Frodo's unseen footage ~ pre or post digital grading ~ all of it, every shot and every scene. We can only live in hope. Thank you for sharing these terrific screencaps. Isn't that a great shot that wasn't used? He looks very mature in it, and very much a thinking person. I wonder what he was actually playing in the scene? Having seen how shots got shuffled around according to changing script needs, maybe it was his reaction to some line that got struck! If you are looking for good quality ungraded shots, it's been my experience that the best place to find them is in the theatrical trailers (or "teasers"). The stuff from the films in the documentaries is sometimes of a lesser visual quality, made from lower resolution or something. But the material in the trailers, meant to be scene in the theatre, to entice prospective audiences, is always very good. Also, because the trailers were made before each film was actually finished, it has been the case that some footage is included that has not yet been digitally graded, or has been graded differently. 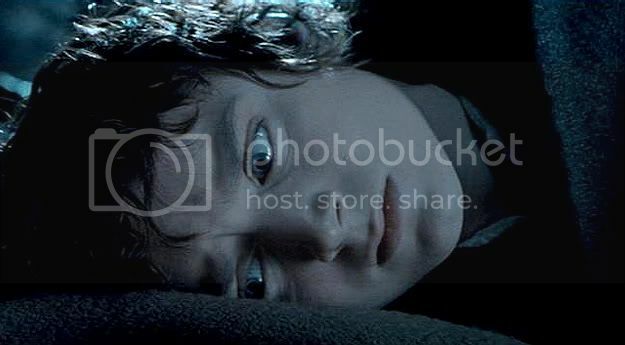 For an example, I'll use some Frodo screencaps. Here’s a link to a post with caps from the final “blue” version of the Lorien scene. Below, there are caps made from a teaser for FotR, caps of the same scene, but *before* the footage had been digitally graded at all. The colours are natural (and GORGEOUS). 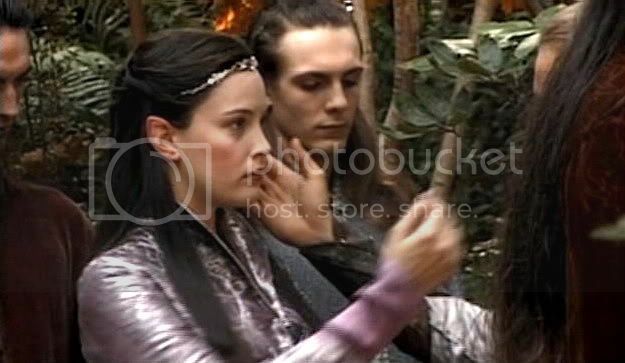 I remember in the FotR EE extras that there was a discussion about how originally they were thinking of grading Lorien in purple tones. Thus, I am sure this lilac-Frodo sequence was the result of that early grading. Looking at all three versions, I think it’s interesting how very differently the same scene “feels”, just based on colour: the warm-toned natural version, the lilac, or the blue. The lilac 'eyelashes' screencaps are simply gorgeous ~ again, that specific shot didn't appear in either the theatrical or extended FOTR films, though how it didn't make the final edit I will never know. I can see I'm going to have to find time to trawl through those teaser trailers and extras yet again. Such a chore! Diligent and interesting research and comparison, Mechtild. I completely agree with you - in nearly all your examples the scenes as seen in the movie are inferior to the pre-final-digital-grading scenes. It's also very lovely seeing "Angelic Osgiliath Frodo" from the TTT trailer again. I remember well how completely mesmerized I was with that shot in the trailer (well, all the Frodo fans were...). Lots of comparisons to midieval saint images were being made and we all swooned mightily. And then the shot wasn't in the film! That was a disappointment for sure. Thank you for posting these lovely images from the trailer. My God, he looks beautiful there. It's also very lovely seeing "Angelic Osgiliath Frodo" from the TTT trailer again (...) the shot wasn't in the film! That was a disappointment for sure. (...) My God, he looks beautiful there. wow, that is amazing the difference with color gradation, do you think it was a bit heavy handed or is that standard? I don't know, Cat. (If it's standard.) I know people have been grading things even before digital resources - underexposing footage shot in the day to look like the night, that sort of thing - making a film's palette look sepia (done for "The Sting"), to increase the sense of the film happening in the past. I think PJ was very into digital grading to increase the sense of LotR being a tale, happening in another time and place. It seems that every scene was graded to a degree, perhaps to keep the look consistent. Maybe that was because PJ just loves technical toys and couldn't keep his hands off the film, or it could have been a choice encouraged by the art design team. On stage designers use different coloured gels in the lights to change the look and mood of a scene, so I guess it's not that different; the filmmakers are doing the same thing digitally. I would say the grading was a little heavy-handed in LotR, but would I even know that if there weren't ungraded clips floating around? Probably not. I would have thought they shot Rohan on consistently wintery-looking days (not a very green place for a pasture land, was it? ), or used a lot of gels in the lighting to establish mood (like in Lorien). I didn't know there was such a thing as digital grading until LotR! But I've used it a lot myself, making my manips.